Wash and prepare the chicken. Place 1 carrot, 1 celery stalk, 1 halved onion, 2 garlic cloves, and 1 bay leaf in a large 3-quart pot. Place the chicken in the same pot. Cover the whole thing with water. Bring to boil on high heat. Don't let it boil vigorously though. Collect the foam. Reduce the heat to low and simmer for a few hours. Strain the soup, reserving the broth and the chicken. Discard the vegetables. Finely chop 1 carrot, 1 onion, 1 garlic clove and 1 celery stalk. In the same pot that the broth was made, heat some oil. Cook the chopped onion until translucent. Add the rest of the vegetables and the broth. Bring to boil and lower to simmer. Meanwhile, disassemble the chicken, removing the bones, skin, and cartilage. Add however much of it you'd like in the soup and reserve the rest for leftovers. If using, add the pasta and cook until ready. 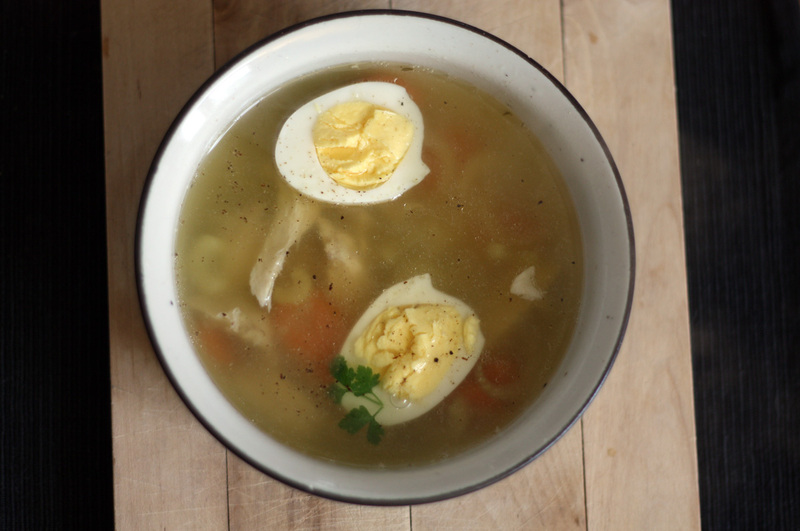 Serve the soup with halved boiled eggs, chopped parsley and/or parmesan cheese.